Divers off the coast of Oahu's North Shore had the rare treat last week of swimming and frolicking with a great white shark, widely believed to be one of the largest in the world, and the thrilling, inter-species encounter was captured on video. "I waited quietly, patiently, observing as she swam up to the dead sperm whale carcass and then slowly to me," Ramsey wrote on Instagram. As the whale came closer, Ramsey extended her arm out toward the massive shark "to maintain a space so her girth could pass." Eventually, Ramsey's gloved hand caressed the shark. 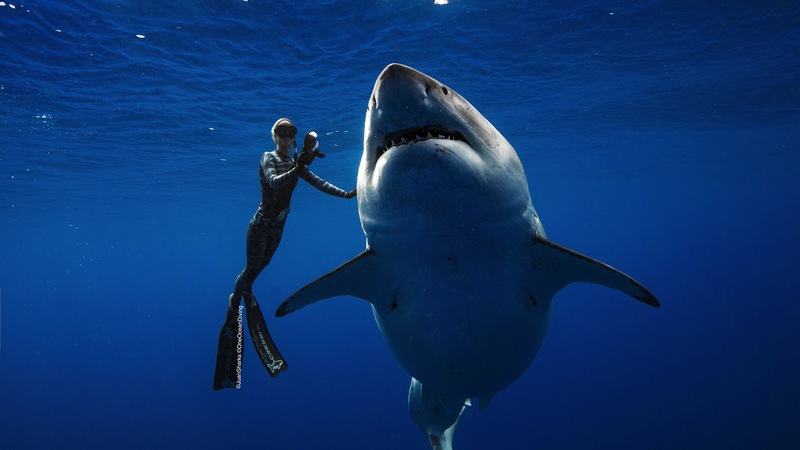 "What some don't realize is that sometimes sharks seek touch," she said. It seems the possibly pregnant behemoth was in an especially playful mood, according to Ramsey, who noted that the apex predator was flanked by two rough-toothed dolphins "who danced around her." Great whites "are not the mindless monsters they are portrayed as," she added in a separate post. But, Ramsey, urged the public not to recklessly jump into shark infested waters regardless of the size of the animals. "They're capable predators who need and deserve respect," she said in another Instagram post. Ramsey told the Honolulu Star Advertiser that Deep Blue looks like she may be pregnant. "She's shockingly wide," Ramsey observed. Marine biologists have not definitely identified Deep Blue as the star of the videos, but Chris Lowe, director of the shark lab at California State University of Long Beach, told NPR the great white's markings match those of the Internet-famous creature, who first made a splash when she was caught on camera five years ago. Additionally, Lowe said it makes sense that it would be Deep Blue because "female sharks usually swim out to the middle of the Pacific, sometimes as far out as Hawaii, for two years before they come back to California or Mexico to have their pups." "Nobody knows for sure why they do it," Lowe continued, explaining that Deep Blue was spotted off the coast of California over a year ago. Regardless, Lowe said tagging data indicates three female sharks have been recorded feasting on the "floating buffet" that is the dead sperm whale carcass off of Oahu. "For a female that's carrying six babies – two to ten babies that will be born at about 4 and a half to 5-feet long, weighing about 40 pounds a piece – that's more than just a meal. It's like five Thanksgiving feasts all in one go," he said. Shark populations around Hawaii have been declining for years and Ramsey said she hopes Deep Blue's moment in the spotlight will also shine a light on much-needed shark protection legislation. "There are currently no laws to protect sharks from being killed" except for a ban on killing them for their fins," she wrote in a statement. "And even that law has many loop holes," she added.